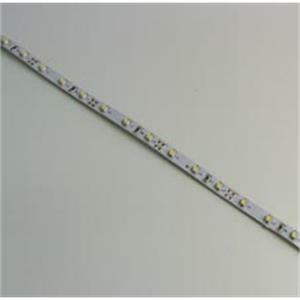 Description A flexible self adhesive strip of 15 Warm White LEDs together with associated circuitry for connecting to 12 V DC voltage. Each strip can be cut into 5 x 3 LED pieces or multiples of 3 LEDs. Just connect to 12V DC power supply. Self adhesive backing can be attached almost anywhere. High intensity output with low power consumption. Each LED has a 120 degree viewing angle for even light distribution. Size 250mm x 8mm.